None of Horizon's faults stopped me from sinking 55 hours into the game, or walking away supremely satisfied with the experience. 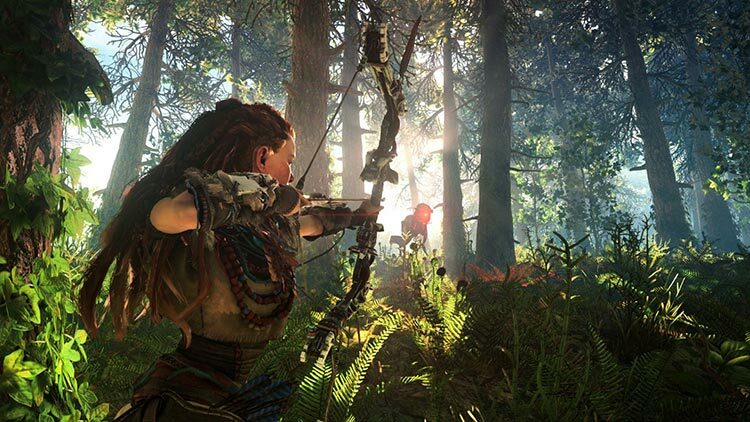 Horizon may not be a revolution for the open-world genre, but it is a highly polished and compelling adventure that proves Guerrilla is more than a single franchise. Guerrilla Games have outdone themselves with Horizon Zero Dawn. A studio that was known for delivering linear first person shooters took a risk with developing an open world game, a genre which is over-saturated at this point. Horizon Zero Dawn is right up there with the best and is easily one of the best games of this generation. Guerrilla Games not only managed to provide a world that is a wonder to explore but they have raised the bar for open world games development. Horizon Zero Dawn is a great choice for those craving action and adventure. With a terrific combat system, a strong female protagonist, and a deep pool of side content, it will surely go down as one of PlayStation’s star exclusives. This is the best looking game that I’ve seen on the PlayStation 4. On top of its visual brilliance, Horizon continues to excel with a great combat system and intriguing world full of opportunities for adventure. Horizon: Zero Dawn is a PS4 must-own exclusive. It crafts a wonderful, fully realized and explorable world, and an interesting story that's worth seeing through to the end, if just to find out what Zero Dawn actually means! Horizon: Zero Dawn has been a long time coming, but it is finally here and it does not disappoint at all. 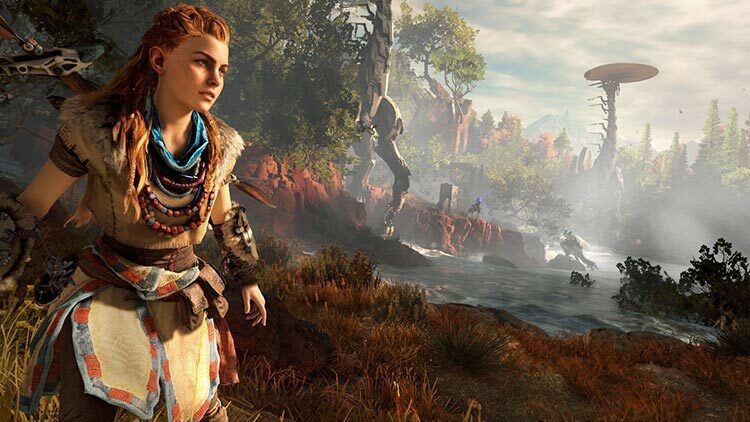 Featuring a likeable new protagonist in Aloy alongside a compelling story, the game will keep you invested, whether through the main story or even the countless side quests that add more lore to this intriguing world. Complete with a deep combat system and stunning visuals, Guerrilla Games has already raised the bar for exclusives this year with Horizon: Zero Dawn. Horizon Zero Dawn is disappointing. It has a story that I struggled to care about (complete with massive expository dumps—yay), a bland protagonist, and overtly repetitive and constraining missions that worked against its open world sensibilities. When Horizon Zero Dawn hit its rare strides—from its gloomy Cauldrons to traveling across its sprawling vistas—it only made me wish the rest of the game were as worthwhile. Across a vast and beautiful open world, Horizon Zero Dawn juggles many moving parts with polish and finesse. Its main activity - combat - is extremely satisfying thanks to the varied design and behaviors of machine-creatures that roam its lands, each of which needs to be taken down with careful consideration. Though side questing could have been more imaginative, its missions are compelling thanks to a central mystery that led me down a deep rabbit hole to a genuinely surprising - and moving - conclusion. 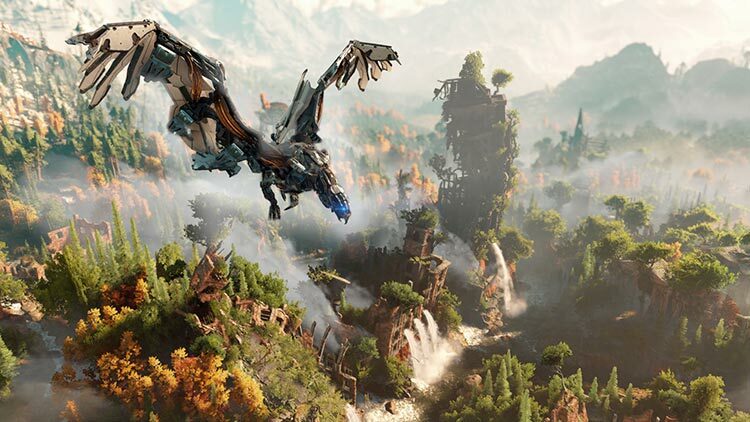 The Guerrilla Games developers have made sure that its game still feels unique by comparison, thanks to a vibrant world bursting with stunning detail, challenging robotic enemies, and a story that explores an uncivilized world in an inventive way. Some weak AI, awkward dialogue sections, and a prototypical open world framework are the game’s bigger faults, but they don’t weigh the game down to much or ruin the experience. When I began Horizon Zero Dawn, I was anxious it wouldn't be able to maintain itself for thirty-plus hours. I'm thrilled that fear was unfounded. The play was constantly rich and rewarding, and the mysteries constantly unfolding. I'm left not just feeling satisfied the entire time, but wanting more. This one is something special. To simply put it, there is a certain appeal to Horizon: Zero Dawn which I have not found in any other open-world RPG game. Perhaps it is the addition of shiny robots to the mix or the story of Aloy herself. Either way, this game has my full attention and I wouldn't call it anything less than stellar. If I had to compare it to another game, The Witcher 3: Wild Hunt and Shadow of Mordor would be on the top of my list. When compared to these two titles, Horizon is riddled with less bugs, more engaging combat, and successfully incorporates stealth gameplay. Try and guess what I’ll be playing for the next few weeks. 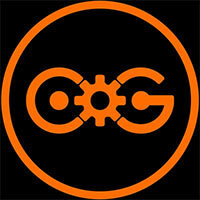 The Ubistuff stops just short of being too busy. The Batman detective stuff, as pointless as it is, goes by smoothly enough. The Far Cry 3 “I need a trout jaw to craft my quiver from a carrying capacity of 10 to 15 arrows” keeps things moving in enough directions to fill out the character progression. Mounts from The Witcher 3 and Red Dead Redemption are always a gratifying way to get around. The unfortunate fact of Horizon is that most of what it does well, other games have done better, and they did it with a compelling who and where. This is first departure from the Killzone series for developer Guerrilla Games, and though you might think the team took a risk by stepping out of its FPS comfort zone to create a third-person open-world action game, you'd never know it was their first rodeo. For every minor imperfection, there's an element of greatness that recharges your desire to keep fighting and exploring Zero Dawn's beautiful and perilous world. An open-world that tailors to each and every interest, Horizon: Zero Dawn keeps combat fresh, with an intriguing protagonist to match. Horizon Zero Dawn is compelling from the first minutes of the game, telling an incredible story and marking it with a deep crafting system and exceptional combat. Aloy is inspiring in her lead role, with the potential to become a new leading face in gaming for a long time to come. Horizon Zero Dawn is a fascinating premise wrapped in a tortilla of tropes. It has detective vision, radio towers, skill trees, masked load screens (Tony Hawk's American Wasteland gets no credit for popularizing this in 2005, by the way), and a world map littered with billions of points of interest -- all stuff you've seen before. But after you set up and execute a cunning plan to decimate a pack of giant robot crocodiles and that smile hits your face, it's more excusable. Horizon Zero Dawn is the kind of game you play to get lost in, and can be enjoyed by players of all types. This could be the beginning of a stellar franchise, and there is something for everyone here. If you own a PS4, you owe it to yourself to give Horizon Zero Dawn a go. With its excellent combat system that is extremely fun to play, and its breathtaking world that begs you to explore it, Horizon Zero Dawn easily overcomes its few flaws and delivers a must-play game that, even this early into 2017, is a dead cert to be one of the best games of the year – perhaps even of the generation. It’s a story-centric adventure that will certainly send you on a captivating journey from start to finish, and then some. The beautiful thing about Horizon Zero Dawn is that it truly reminds me of the first time I stepped foot into the shoes of Master Chief. This is certainly something special that must be experienced first-hand, It rightfully lands atop my list of best games in 2017. 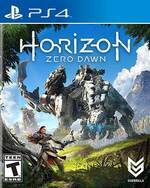 Horizon Zero Dawn boasts a stunningly realized vision of the post-post-apocalypse, accompanied by a fascinating and chilling mystery surrounding the fall of civilization and surprisingly deep and strategic combat which combine to create one of the best new IP’s in years. This has been a lengthy review to be sure, but great games with so many awesome things to do are easy to talk about for a long time. Indeed, there is a lot more to talk about. Horizon Zero Dawn had a lot of goals and some very lofty ambitions, particularly in a new series outside of the familiar for Guerrilla Games. I am more than happy to say that they met most of those goals and exceeded in many. I really enjoyed my time in the world of Horizon. From its gorgeous landscapes to its interesting combat, the game feels like a world begging to be explored. 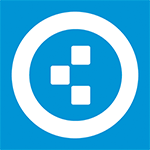 However, some of its systems feel half-baked and shoehorned into the mix, creating a lopsided experience at times. Still, like most Sony first-party games, it still feels like a special event, and I would love to see Guerrilla Games get another shot at something outside the Killzone universe, heck I would definitely be in for another game in the Horizon universe. This is a great experience, and one PS4 owners will definitely not want to miss. The presentation end of the game holds up its end of things with a solid soundtrack, great voice acting, and a cohesive design that makes all its disparate parts fit together. All in all, it's a great game, it's Guerrilla's strongest release to date, and I suspect I'll go back in after the fact to clean up whatever side quests and errands I have remaining, if only to spend a little more time in that world. 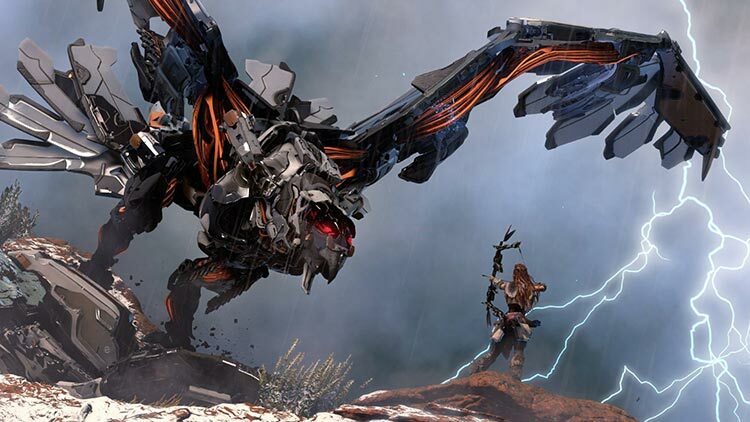 Destroying large robot beasts while frantically switching between weapons is intoxicating, but the strength of Horizon Zero Dawn is in Aloy's engaging quest to find out who she really is. Debuts don't get much stronger than Horizon: Zero Dawn. Guerrilla Games' latest borrows liberally from a variety of different sources, and yet it leverages these fundamentals to forge an experience that's daringly unique. The main quest tires a little towards the end, and the writing never hits the same highs as The Witcher 3 – but the tactical action stands leagues ahead of what we've come to expect from the genre, and the presentation is quite simply unmatched. Horizon: Zero Dawn stands worthily alongside these iconic releases. The story is enthralling, the open world is lush and inviting, the gameplay extremely addictive, and the sheer scale of it all is amazingly vast. Simply put, this is a phenomenal game. Horizon Zero Dawn is a bit of a slow burn, but there’s more to Guerilla Games’ latest than just its staggeringly pretty graphics. The story surprises as it takes several twists and turns and explores the past, but the game’s beating heart is with its excellently tense and engaging robotic monster hunting. State-of-the-art visuals help create one of gaming’s most entertaining open worlds, even if the gameplay doesn’t quite reach the same standards. Superb graphics and art design, and a huge, impressively interactive, open world environment. Highly enjoyable combat and stealth, with an interesting array of weapons. This generation has been blessed by some excellent RPG and action-adventure offerings so far and while Horizon Zero Dawn sometimes shows its team’s relative inexperience in places, the overall construction, the combat and the characters elevate it into the upper echelons of the genre. It might not be Witcher III level of excellence, but for a first attempt from Guerrilla, it’s impressively close. Horizon Zero Dawn reinvigorates open-world RPGs with an excellent story, creative science fiction, and demanding gameplay. Aloy’s debut is one of PS4’s greatest games. Not as happy, definitely, but at the end of the day I loved Horizon: Zero Dawn when it was a small, contained dinosaur hunting game — and then I loved it more when it revealed it was actually The Witcher: Dinosaur Edition. I can see its faults, I know they exist, but this game feels so much like it was built with me in mind that I'm happy to ignore them. Es un ejercicio que roza la excelencia en lo técnico y en lo lúdico, un engranaje que funciona y seduce y satisface, pero que no sabe dar el golpe de gracia definitivo en el corazoncito del jugador. Es un título del que presumir por tenerlo en el catálogo de exclusivos de su consola, una pieza de esas que decantan la balanza figurada en esa guerra imaginaria entre plataformas, y que será recordado como un juego bien hecho, con finos acabados y cierto rigor en sus mecánicas. Horizon: Zero Dawn es una aventura larga y sorprendente, que consigue atrapar (y vaya que si atrapa) por su atractivo mundo de juego, por el carisma de su protagonista, por la profundidad de su propuesta jugable y por lo bello que resulta en casi todo momento. Un juego a medio camino entre la acción y rol, enmarcado en un mundo abierto que nos recuerda a los mejores títulos del género de los últimos tiempos. Uno de los imprescindibles de PS4, y de principios de este 2017. Con Horizon: Zero Dawn no sólo presenta una agradecida bocanada de aire fresco en forma de una nueva IP con descomunal potencial para crecer, sino que se ha sacado de la manga una aventura de mundo abierto carismática y todo un caballo de carreras gráfico. Sin embargo, todo eso no serviría de nada si no hubiera detrás de todo ello un videojuego brillante, y lo cierto es que Guerrilla ha conseguido dar un nuevo puñetazo sobre la mesa. Horizon: Zero Dawn es para ti si buscas un juego de acción con toques de RPG, una buena campaña con una muy interesante historia por contar y si explorar un rico mundo virtual es lo que te apasiona. A mi me encantó y se los puedo recomendar ampliamente como ese juego que todo poseedor de un PS4 amante de los juegos de acción debe probar en algún momento. Horizon: Zero Dawn es uno de los juegos más redondos que se pueden encontrar hoy en día en la cada vez más habitual fórmula del Mundo Abierto. Guerrilla Games ha conseguido producir el que probablemente es su título más sólido con una propuesta muy completa a todos niveles. Guerrilla ha salido airosa de semejante reto, y los cinco años de trabajo invertidos se notan en todos sus aspectos, ofreciéndonos uno de sus mejores juegos hasta el momento. Una buena historia, un apartado jugable muy cuidado y divertido, unos gráficos espectaculares, y en definitiva todo lo que se le podía pedir a una superproducción como esta, que sabiendo lo que ofrece, va a dejar satisfecho a casi todo el mundo. Guerrila Games se reinventa y da vida a una aventura bestial, y no sólo en lo técnico. Horizon: Zero Dawn es un action RPG como la copa de un pino, con un sistema de combate tan elaborado como satisfactorio, y un universo tan colosal que ya se atisba en el horizonte un futuro brillante para Aloy. Ha nacido una estrella. Glückwunsch an Guerrilla Games! Ich bin überrascht, dass mich dieses Horizon Zero Dawn so gut unterhalten konnte, weil mich Far Cry Primal letztes Jahr so schnell langweilte. Dass die Niederländer grafisch begeistern würden, war fast zu erwarten. Dieses Abenteuer demonstriert sowohl hinsichtlich der Kulisse als auch Animationen die technische Kompetenz dieses Studios - es gehört ganz einfach zum Ansehnlichsten, was man aktuell erleben kann. Horizon: Zero Dawn macht genug, um sich – trotz aller Ähnlichkeiten – nicht ständig wie eine Mischung aus Far Cry, Assassin's Creed und Tomb Raider anzufühlen. Aber es macht nicht genug, um auch wie etwas ganz Neues zu wirken. Entwickler Guerilla Games hätte – vor allem in spielerischer Hinsicht – gern manchmal noch etwas mehr fordern können, um Horizon noch deutlicher von der Konkurrenz abzusetzen. Amateurs d'aventure haletante, de mystère envoûtant, de contemplation enivrante et d'affrontements farouches, Horizon : Zero Dawn s'impose comme une foudroyante bénédiction. Rares sont les nouvelles licences ayant réussi d'entrée à placer la barre si haute. Grâce à ses paysages aussi variés, qu'éblouissants, à son rythme maîtrisé, et son gameplay affuté, la quête d'Aloy redéfinit ce que l'immersion dans un open-world signifie, à défaut de révolutionner le genre. 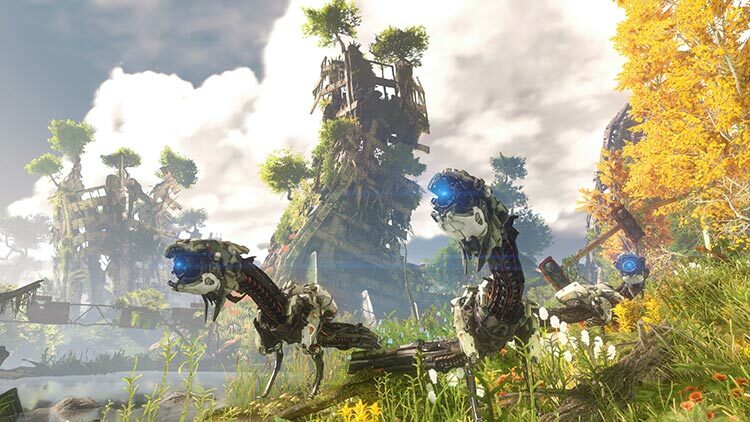 Porté par une héroïne attachante, un univers fascinant et des combats contre les machines particulièrement réussis, Horizon : Zero Dawn s'immisce sans peine aux côtés des meilleurs mondes ouverts de ces dernières années. Il n'est pourtant pas exempt de défauts, en témoignent ses animations faciales quelconques, des IA humaines souvent aux fraises ou quelques paresses narratives. Novice en matière d’open world, Guerrilla Games réalise un véritable coup de maître avec Horizon : Zero Dawn. Le jeu s’inspire des références du genre tout en ayant l’intelligence d’offrir un univers singulier qui nous a profondément marqués. 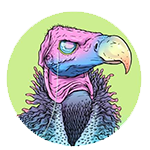 On a pris un pied monstre à incarner Aloy, une héroïne au charisme limité, certes, mais dont les talents de chasseuse permettent de profiter d’un système de combat archi huilé. La dimension RPG, dans les personnages et l'écriture plus que dans les chiffres, montre cependant qu'il y a encore du chemin à parcourir avant de venir jouer sur les terres des champions actuels du genre, sans même parler des cadors de la narration en général. On y passe en fin de compte assez de bon temps pour oublier celui qu'on a perdu dans l'équation, mais il est à peu près certain qu'on n'en gardera aucun souvenir indélébile. Horizon Zero Dawn é uma excelente aventura, que nos prende de início a fim e apresenta uma das premissas mais originais de um videojogo nos últimos anos, sendo uma lufada de ar fresco no atual panorama de 'déjà vus' da indústria. O mundo aberto é bem desenhado e cativante, a história interessante, apesar de pouco explorada em certos aspetos. Insomma, l'ingresso di Guerrilla Games nel mondo degli open-world può definirsi riuscito: noi siamo rimasti soddisfatti durante le tante ore di gioco offerte dal titolo, al netto di quelle criticità che ne mitigano il giudizio complessivo. Horizon Zero Dawn, quindi, rappresenta una nuova proprietà intellettuale che ha le spalle larghe per accogliere futuri capitoli, e già a partire da questo sarà in grado di appassionare e divertire i possessori di PlayStation 4 che amano il genere. Una volta giunti alla fine e aver scoperto ogni più recondito segreto di Horizon, vi accorgerete all'istante di quanto vi mancherà e quanto vogliate ancora sospendere il vostro tempo all'interno di questo mondo affascinante e unico. Sebbene si potesse fare qualcosa in più per quanto riguarda la narrazione, il peso delle scelte, degli elementi non proprio originali e alcune mancanze che probabilmente sottolineano una comprensibile prudenza, Guerrilla ha fatto davvero centro, aprendo un nuovo ciclo per la propria carriera e presentando al pubblico un'IP di grande valore e con enormi potenzialità per il futuro. Horizon: Zero Dawn segna l’esordio di Guerrilla nel campo dei giochi di ruolo ed azione ad ambientazione open world. Il genere è talmente diverso da ciò di cui il team olandese si occupava prima (sparatutto in soggettiva con la serie Killzone) che la sfida era sicuramente tosta. Ebbene, è stata superata, con risultati non perfetti in tutti gli aspetti, con qualche indecisione e qualche segno di inesperienza, ma anche con prestazioni di massimo livello in alcuni campi. Редкая игра способна вызвать внутри искренний отклик. Такой, чтобы захотелось простить ей все недостатки и забыть про сон минимум на неделю, целиком погрузившись в виртуальный мир. Horizon как раз такая. У нее полно недостатков, неизбежных, учитывая нулевой опыт разработчиков в выбранном жанре. И тем не менее вот результат – безумно затягивающая вещь, которую хочется рекомендовать, о которой хочется рассказывать друзьям. Итог всего сказанного: Horizon – это красивая и технологичная игра. Которой мешает лишь неопытность разработчиков в деле создания большого открытого мира. Её идеальным форматом стал бы коридорный боевик часов на 15 стабильно держащейся динамики. Где можно было бы равномерно выдавать сюжет, пополнять по мере продвижения зоопарк, режиссируя разные ситуации. Поставить точку раньше, чем в рукаве закончится запас козырей. Horizon: Zero Dawn, her köşesinden bir ayrıntı fışkıran, daha da önemlisi eşsiz bir dünyaya sahip olan ve oyuncuyu kendine bağlamayı başaran bir yapım. Yan görevleri de yaptığınız taktirde ortalama 30 - 40 saatlik bir oynanış süresi sunuyor. Avcılık görevleri, keşfedilecek noktalar, oyunun sürekli sizi etrafı dolaşmaya, izlemeye itmesi gibi daha bahsetmediğim onlarca noktası bulunuyor. Bazı eksiklerine rağmen PS4 sahiplerinin muhakkak oynaması gereken ve her anından keyif alacağı bir yapım olmuş. Met Horizon Zero Dawn zet Guerrilla een nieuwe standaard, vooral vanwege de geweldige variatie die de open spelwereld te bieden heeft. Daarbij heeft de game een heerlijke campaign met een sterk verhaal, waarbij Aloy nu al een gedenkwaardig gamepersonage is. Alle opmerkelijke dingen die ik ben tegengekomen - die werkelijk piepklein waren, zoals twee omstanders die precies hetzelfde zeiden - doen geen afbreuk aan de geweldige speelervaring die Horizon is. Heb je een PS4? Dan is Horizon Zero Dawn een must have. Horizon Zero Dawn is namelijk een fantastische game en potentieel de beste game van het jaar! Hij is toegankelijk, maar uitdagend, ziet er werkelijk fenomenaal uit en biedt je tientallen uren aan speelplezier! Er zijn wel wat kleine puntjes, zoals soms irriterende lensflares en wat gebrek aan variatie bij de echte dieren, maar niets van dat alles is heel storend. Dit zou zomaar eens de beste game van 2017 kunnen zijn. Twórcy z Guerilla Games udowodnili, że potrafią robić nie tylko pierwszoosobowe strzelanki, ale również gry z otwartym światem. Horizon Zero Dawn na długo pozostanie w mojej pamięci przede wszystkim dzięki niesamowitemu światu oraz wciągającej, choć liniowej historii. Nie wspominając już o grafice. Według mnie to najpiękniejsza gra, jaka kiedykolwiek powstała. Gdyby nie parę baboli związanych z zadaniami pobocznymi i ich powtarzalnością oraz z używaniem przedmiotów, ocena byłaby co najmniej o oczko wyższa. Horizon: Zero Dawn jawi się jako powrót Holendrów do pierwszej ligi tytułów tworzonych z myślą o PlayStation 4. W żadnej mierze nie jest to produkt idealny i wiele można mu zarzucić – oprócz jednego. Dzięki zróżnicowanym krajobrazom, pięknej grafice i satysfakcjonującej mechanice walki wciąga jak bagno. Trzeba tylko przebrnąć przez nijaki początek, a potem jest już coraz lepiej. Mam nadzieję, że to nie ostatnie słowo Guerrilli w tym temacie.